Have you ever met with a potential customer who wanted an estimate for their roof, and simply wrote up a bid and left it or mailed it to them and then waited around hoping to hear back from them? Worse, is this how you always operate? This old school method of trying to get business by banking on having low or competitive bids and crossing your fingers hoping the homeowner picks you out of the other five bids they have now collected because you didn’t close them on the spot doesn’t work, and leaves you powerless with no control over your income and sales. When you leave an appointment without sitting down with the customer and asking for the order, you may as well be throwing money down the drain. Everyone has done it, but the question is why? Why would a salesman ever let a golden opportunity to close a deal like being on the property with an estimate while the homeowner is present ever slip through their fingers? Sometimes it’s due to laziness, sometimes it’s due to being unprepared, but MOST times it is because of fear – fear of rejection, fear of objections, and fear of not knowing what to say to close the deal on the spot. When you really think about it, isn’t being fearful of rejection really silly? Nothing bad happens when or if someone says “no.” You don’t get slapped, you don’t lose your job, it doesn’t cost you any money. But you miss 100% of the shots you don’t take, so why would anyone EVER leave an appointment without sitting down and asking for the order? Have you or anyone you know ever asked a girl for her number at a bar? Of course! Sure, it can be intimidating, and nobody likes the possibility of rejection, but if you don’t ask, you’ll never know! Without asking, you are leaving many “yesses” behind, simply because of fear of hearing “no.” It’s just a word! It doesn’t hurt. Doesn’t it make sense that we should just realize that nothing bad is going to happen? Now that we know what we need to do, shouldn’t we just be able to walk out the door and start closing deals left and right? We SHOULD, but most can’t. Or don’t. So what’s the answer? First you have to rid yourself of the fear of hearing “no,” learn how to prepare to present an estimate, learn to expect the order, and have a solid close. Your presentation will cover information about you and your company to establish a good reputation for quality workmanship and customer service. Next it will cover the brands and quality of materials your company uses, and what options homeowners have as far as upgrades. You will identify areas of opportunity (adding ice and water shield, upgrading to lead pipe boots, installing gutter screens, etc.) and create need for your products and services. Next, you will cover what the estimate includes, a comparison of lower and higher prices they might find in the same market, the reason for your pricing (better quality materials, local labor, deals on materials from suppliers, etc. ), and then the solid closing question where you ask for the order. 2) Use a reference list. People rely heavily on reviews and testimonials from other third-party, unbiased customers who have already had an experience working with you or your company. For this reason, having a stacked reference list of happy, satisfied past customers is an invaluable asset and tool in closing deals. 4) Present your proposal and ask for the order then and there. Never, EVER simply send a bid in the mail or drop off an estimate and then go home, sit on your fanny and cross your fingers, hoping the phone rings and that they’ll choose you. This is an enormous waste of time. Sit down with your potential customers and sell them on the job and leave with a contract, not a question mark. Use these tactics starting with your very next appointment and opportunity to close a deal, and stop wasting your time mailing out bids and hoping and wishing they’ll call you back. By the way, in our eBook Diamonds in the Sky: Introduction to Storm Restoration Sales, we go into the exact word-for-word presentation we use on our appointments to close 95% of our customers on our first sit-down. We also cover the biggest mistakes sales reps make on appointments that cost them the deal and how to avoid them so you can close deals and earn business that other companies are losing because of these mistakes. 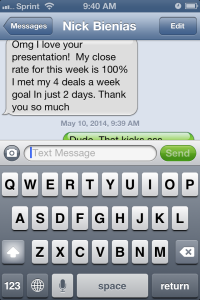 Want more sales tips just like these sent straight to your inbox? Ask and you shall receive. Just enter the ol’ email address above and we’ll send you brilliant “aha”s every week. We provide plenty of quick tips and advice for free, but if you want to dive DEEP into the main pillars of what it takes to be a top selling, badass force to be reckoned with in this industry, invest in yourself and enroll in our comprehensive online course. It’s a no-holds barred arsenal of our word-for-word scripts, door knocking approaches, supplement strategies, and essentially our step-by-step blueprint to selling a million dollars in hail damage sales this year. Just click here to learn more. Thanks for this amazing resource! I definitely agree that having a stacked reference list is important. In my experience, leads from referrals are over 3X more likely to become paying customers!